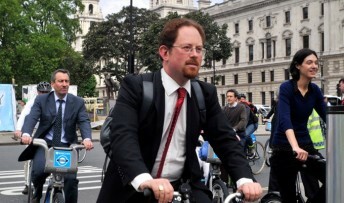 MP Julian Huppert will today (Monday, September 2) lead a Parliamentary debate aimed at keeping cycling firmly at the top of the government’s agenda. Julian is proposing that Parliament formally welcomes the recommendations from the Get Britain Cycling report, sets bold targets for increasing travel by bike and calls on the government to show strong political leadership, including an annual Cycling Action Plan and sustained funding for cycling. The landmark report, from an inquiry led by Julian as co-chair of the All Party Parliamentary Group on Cycling, set out 18 recommendations based on evidence from experts from all fields on how to improve cycling and make it safer. It called for a national cycling champion to lead a call for 10 per cent of all journeys in Britain to be made by bike by 2020 with funding of at last £10 per person per year for cycling, increasing as cycling levels increase. The report also calls for 20mph speed limits to become standard in urban areas and lower speed limits on many rural roads. And it says that all children should be given the chance to learn the skills of road cycling, at primary and secondary school. Julian will tell MPs that cycling has huge advantages being fast, safe, healthy and environmentally friendly. “But we can only encourage more people to cycle and make it safer for them to do so if we make sure that the emphasis is on cycling in the future planning and design of our towns and cities,” he said. “If we are to increase cycling journeys we need to increase our cycling budget and that relies on leadership from this government. A national cycling champion would advocate for cycling across all departments. The report has been welcomed by a wide range of organisations, including the Automobile Association.